Black and Decker is a name with instant recognition across the USA. This brand is known for the the things a homeowner needs - many model options at a good price. Although not built for the professional landscaper, this brand might very well be right for you. 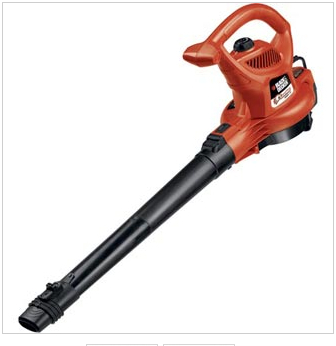 The Black and Decker Leaf Blower model BV2500 Blower Vac acts as a blowe and a vacuum, as the name implies. The electric motor is 12 amps, with an air speed of 200 miles per hour (MPH). The mulch ratio is 10:1 when used as a vacuum picking up dry leaves. This machine will reduce 10 bushels of leaves into a tidy 1 bushel bundle, saving on time and space. The sound level is a conservative 65 decibels (db), and the weight is 8.1 lbs. A leaf bag comes standard. Plan on spending about $55.00 for this basic machine. The Black and Decker model BV3600 is also powered by the 12 amp electric motor. Also considered a blower/ vac combo, this machine also boasts of a 10:1 mulch ratio. A two speed motor varies the air speed between 180 (low setting) to 240 (high setting) MPH. The weight is 8.1 lbs, with a noise rating of 69 db. The leaf bag comes standard. The price this cool baby is about $60.00. So maybe you prefer a cordless blower, for a quick clean up of the sidewalk after mowing. Black and Decker leaf blower has several models to choose from. Model CS100 Sweeper is a 12 volt machine, that weighs in at 7.1 lbs. The air speed is 120 MPH, with a price of $80.00. The model NS118 Cordless Sweeper bumps up to 18 volts. This baby weighs in at 4.8 lbs, and makes less than 65 db noise. The wind velocity is 120 MPH. The price includes a charger, and is $95.00. Looking for more power with a better battery? Model LSW20 Cordless Sweeper may be just the ticket. The power source is a 20 volt lithium battery, that produces an air speed of 120 MPH. The weight is a hardly noticeable 3.7 lbs, with a whisper-quiet motor rated <66 db. A smart charger is included, of course for about $110.00 total. On the top of the cordless hill, we find the model LSWV36 Cordless Sweeper/Vacuum. This baby has a take-no-prisoners approach, with a 36 volt lithium battery and fast charger. Mulch ratio is 6:1, with an air speed of 120 MPH. Collection bag comes standard. The whole outfit will set you back about $80.00, which is a very reasonable price. The Black and Decker model BV3800 is powered by a 12 amp motor, and produces 180 or 240 MPH airspeed, depending on the switch position. The mulching ratio has been improved to a nice 16:1, making small work of even large piles of leaves. The weight remains at 8.1 lbs. Plan on spending $75.00. Topping out the Black and Decker leaf blower line up are models LH4500 and LH5000. Both have a mulch ration 16:1 mulch ratio, with a weight of 8.1 lbs. Air speed is variable on the Model LH4500 between 180/240. Model LH5000 has a fixed speed of 240 MPH. The price for the highest performance machines from Black and Decker are $80.00.